TABASCO - is sired by Dixie Hunter, out of the famous Delta Diamond, by Monarch. He is a beautiful chocolate, red & white speckled roan bull, much the same color as Rural Delivery. His pedigree for massive horn is in the very upper echelon. Many feel that Dixie Hunter was the best siring son of Classic & Rose Red. Delta Diamond was no doubt the greatest daughter of Monarch. She sold for $8,000 at 15 years old, sporting over 68" horn tip to tip. She was the cow that made Monarch famous as a beautiful horned female sire. Tabasco is ¾ Butler & ¼ WR. He traces back on the WR side to WR 1005, who also was the major horn contributor in the pedigree of Doherty 698 & Twist 21. Many of the largest horned cattle ever to come from the Wichita Refuge trace to WR 1005 through her most famous son WR 2308. Tabasco has 63" horns. 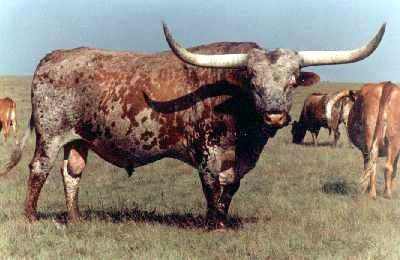 Putting him into the top 1/10 of 1% of the Texas Longhorn breed for large horn development. Use him for valuable calves with dynamic color and horn.